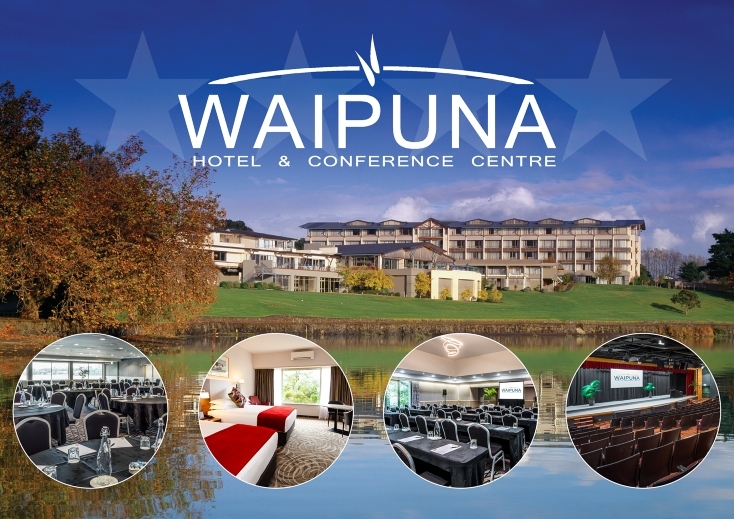 Waipuna Hotel and Conference Centre is one of New Zealand’s largest and most comprehensive conference facilities and is only 15 minutes from Auckland’s city-centre and the international and domestic airports. Meaning ‘Spring of water’ in Máori, the Waipuna Hotel is set amongst 6.26 acres of beautiful parkland overlooking a picturesque saltwater lagoon. Guests enjoy the stunning always changing view of the tidal lagoon and can enjoy walking or cycling the pathways around the lagoon. The staff at Waipuna Hotel and Conference Centre have perfected the art of hosting conferences, meetings, exhibitions, product launches, seminars and special events and work hard to ensure their guests have a memorable experience. The hotel has 148 spacious hotel accommodation options ranging from Bureau rooms to Presidential suites – perfect for families, holiday makers and corporate travellers. The Waipuna Hotel and Conference Centre’s profits are channelled back into the local community supporting initiatives such as local parks and playgrounds, sports fields, local education, historic places and conservation.